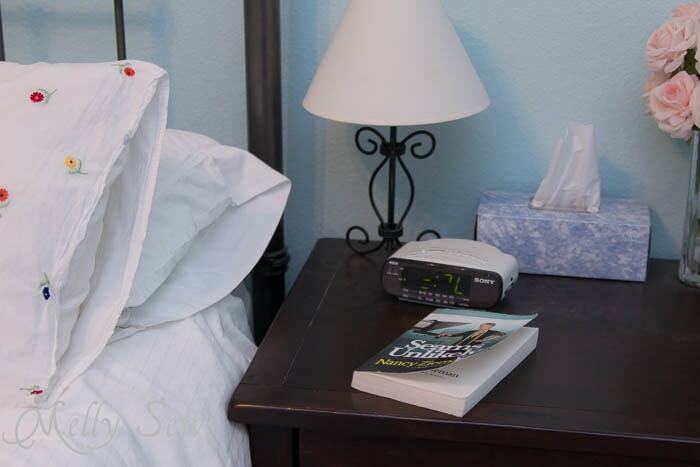 Psst- want to see what’s been on my nightstand? 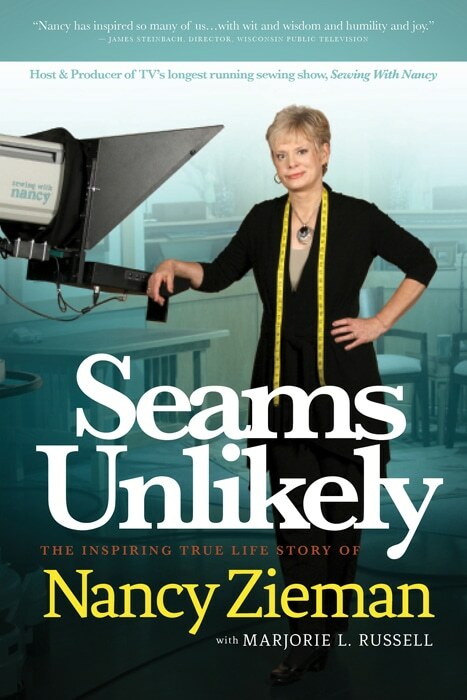 It’s Nancy Zieman’s new autobiography, Seams Unlikely (affiliate link). Growing up, I remember occasionally watching Sewing With Nancy on TV. Though as far as I was concerned, my mom knew everything there was to know about sewing, so I wasn’t watching it to learn, I would sometimes find it while flipping through channels and it was fascinating to see someone on TV sewing. I grew up in an age when sewing, particularly sewing your own clothes, was not something anyone else I knew did, so the idea that there were enough people “out there” who sewed to merit a TV show was pretty cool. Fast forward 20 years to discovering the blogosphere and being able to connect with so many others who sew through the magic of the internet. What a difference! But I was still intrigued by how much of Nancy Zieman’s autobiography I could still relate to as a woman starting my own sewing related business. I am thrilled to be part of the Seams Unlikely blog tour today. (Disclaimer – I received a free advance copy of this book for review. All opinions are my own. Obviously.) I read the book cover to cover, finishing it while at Alt Summit, and I’m sure I annoyed my roommates with constant, “Hey, I just read…” and, “Wow, did you know…” type comments as I was reading. The writing is a lot like Nancy talks on her shows I’ve seen – it’s very matter of fact and reporter-ish, not writing that aims to put you in the narrator’s shoes to experience what they’re experiencing. And I’m sure I’m a little more critical of that as someone with an English degree and post-graduate work in creative writing. But the book drew me in despite that writing style. The further I got into the years when Nancy was starting her business, the more I found myself drawing comparisons between her experience of starting a business before the internet and my experience of starting one after. Yes, the internet can make it easier to find and reach your audience worldwide. But just like Nancy found before she had that tool, it is about providing value to your customers and nurturing relationships. One of my favorite quotes from the book was this one, ” The term ‘sewist’ is relatively new, but it is one I wholeheartedly embrace…sewist elevates interest to the realm of skill.” I could not agree more! I was also fascinated by Nancy balancing motherhood with a demanding career, again because this is something I relate to. I admired her for admitting she could not do it all and singing the praises of Joan, who cared for her children during the day so she could work. For the record – my youngest son goes to preschool and my older one is in all day kindergarten. I, too, am not superwoman and could not do what I do if I was caring for them full time during the day. She also speaks candidly about her husband pitching in with home and work to help her succeed – something else I can relate to as I am blessed to have my own very supportive husband. Would you like to win your own copy of Seams Unlikely? Comment on this post on Nancy Zieman’s blog to enter. Twenty copies of the book will be given away on February 18. If you’d like to see more reviews of this book, you can check out the rest of the tour (also – I’m kind of in awe of a lot of the company I’m in). Melly, what a treat to read your review of my book, Seams Unlikely. I am glad that you can relate to my not being a super mom! It takes a team at home and at work! I have always been inspired by Nancy! I would love to have her book. I am inspired by your blog as well. Thanks! This book sounds fantastic and I know would be a wonderful read. I look forward to reading the blogs every morning. This would have a wealth of information. Sounds like a great story! I would love to read it! Thanks. Hi! Nancy is awesome and should be singing Helen Reddy’s I am Woman. But she is so sweet and giving. Thanks for this chance! This really sounds like an awesome book and would love to read it!!!! Thanks for the chance to win!!!!!! Nancy’s book, ‘Seams Unlikely’ sounds like great read. I enjoy watching Nancy whenever I can find her show on tv. 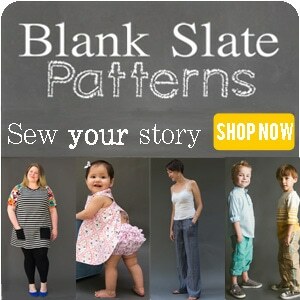 Being a visual person, I enjoy reading my emails from ‘Melly Sews’ and following different links posted on your blog. Inspiration from you both encourages me to continue sewing what I know and to also venture out including the new. Thank you!! I admire Nancy for going after something she loves and succeeding. 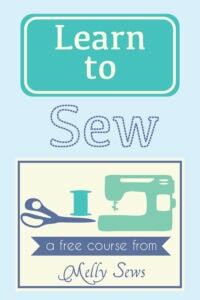 I am getting back into sewing after 20 years and her website has really helped. I’ve admired Nancy for many years and look forward to reading her autobiography! I already read Nancy’s description of her newest book and look forward to reading it soon. She has been a real life saver for me with her method of altering patterns. I loved watching Nancy’s show and I have several of her books. She is an inspiration to all sewists! I was lucky enough to visit Nancy Zieman’s store in Beaver Dam WI back in the days when everyone was making t-shirts. I used to live in WI but have since moved to TN. I used to watch her shows when time permitted and I look forward to reading her autobiography. I still get her catalogs. She is one intelligent sewist! Does that make sense? AndI just pulled out one of her okd books about serging this evening. I’m feeling lucky! And I just pulled out one of her old books about serging this evening. I’m feeling lucky! I have watched Nancy’s show since I was a little girl, too, when the guys in the house aren’t around and will let me. 😉 Thanks for the chance to win her book! Thank you for your review. I look forward to reading Nancy’s newest book. This would look so good on my night stand too!! Her story (what little I read) is one I must finish! !